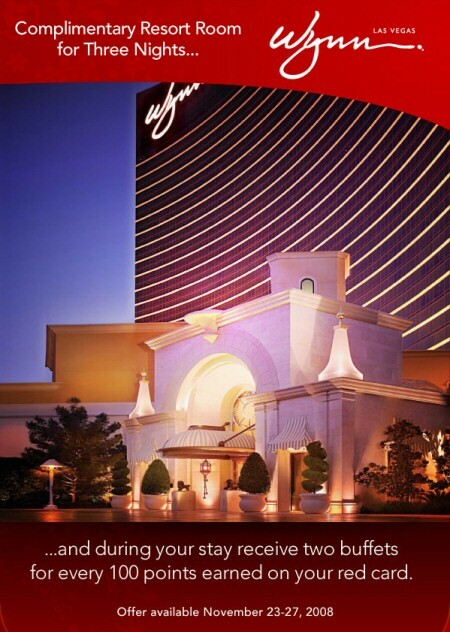 Wynn Las Vegas must be in serious trouble. What other explanation is there for an apparently recession-proof world class hotel, whose typical clientel are supposed to be the kind of folks who don’t even notice when the rest of the world runs out of money, to send me – ME – this kind of offer? I was wetting myself over the last offer I had, which was just a theoretical free night if you pump enough coins through the right machine. This one is 3 completely free nights, plus the added temptation of free food if you play. Two buffets for 100 points is too good a deal to pass up. $900 coin in @ 99.5% video poker means it costs you, on average, $2.25 per buffet. Considering the only action I have ever given to the Wynn is running precisely $900 through a machine in order to get this same food comp as a new player last year, plus the couple of hours I managed to last in their poker room before the $3 chip denominations really did my head in, I have no idea why they’d give me anything. The only minor problem is the very specific dates for this offer. It’s no good unless they’re also going to comp me a flight and I doubt they’re quite that desperate yet.